Philip asks the man in the chariot, "Do you understand what you are reading?" FTER PETER AND John went back to Jerusalem, one day an angel spoke to Philip and told him to leave Samaria too and go on an errand. Philip did not know just what the errand would be, but he rose up at once to obey the angel's command. Along the dusty road he traveled, going south till he came to Jerusalem. Still farther south he went, not stopping to visit the apostles or any of his friends in the city. Now the road began to lead toward the desert of Gaza, and few people went that way. But Philip was not the only traveler on the road that day. Ahead of him, riding in a chariot, was a stranger who had come many, many miles to worship God at the temple in Jerusalem. This stranger was from the land of Ethiopia, and he was an officer of the queen of the country. He had heard about the true God and he wished to become a worshiper of that God. He had come all the long way from Ethiopia, and now he was returning again to his homeland. God saw the desire in this man's heart to worship him in the right manner. He knew the rulers in Jerusalem would not help the man to understand the true religion, so he sent Philip on this errand to preach to the stranger. 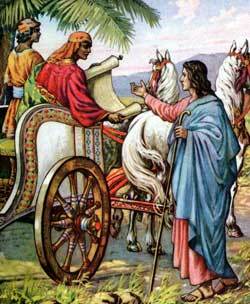 When Philip saw the chariot, God by his Spirit caused him to understand why he had been sent. So Philip ran to catch up with the chariot. While in Jerusalem this Ethiopian had bought a copy of the Scriptures to take with him to his own land. And as he rode along he read aloud from God's Book. When Philip came near he heard the man reading from the book of prophecy that Isaiah had written. Philip walked along beside the chariot and listened. Presently he asked, "Do you understand what you are reading?" The Ethiopian looked up quickly, and seeing Philip, replied, "How can I understand when I have no one to teach me?" He then invited Philip to ride with him in the chariot and tell him the meaning of the strange words he had just read. These are the words he read of Isaiah's prophecy: "He was led as a sheep to the slaughter, And as a lamb before his shearer is dumb, So he opened not his mouth, His story who can tell? For his life is taken from the earth." "About whom is the prophet writing?" asked the Ethiopian, "is it of himself or some other man?" Then Philip began at that very scripture to preach to him about Jesus; for Isaiah had used those words to describe how Jesus would be treated by his enemies. As they rode along the highway they came to a place where there was water. The Ethiopian thought at once of what Philip had told him about baptism, so he said, "See! here is water; why may I not be baptized?" Philip answered, "If you believe with all your heart you may be baptized just as others who believe." And the man replied, "I do believe that Jesus Christ is the Son of God." At this he commanded the servant who drove the chariot to stop, and he stepped out with Philip and went down with him into the water. And Philip baptized him there. When they were coming out of the water the Spirit of God caught away Philip, and the Ethiopian saw him no more. But he went on his homeward journey rejoicing because he had found the true religion. Now he knew that his sins were forgiven through faith in Jesus' blood. And now he, too, could tell others about the gospel story. After this had happened Philip came to a place called Azotus, and as he went he preached the gospel in every city along the way, until finally he came to Caesarea, a city on the shore of the Mediterranean Sea.